o Living in poverty or situations of deprivation. Organisations must be working to combat this disadvantage and make a real difference to children and young people's lives. Not-for-profit organisations that work with disadvantaged children and young people of 18 years and under who live in the UK, the Isle of Man or the Channel Islands are eligible to apply for grants of over £10,000 for projects for up to three years. There is no upper limit for Main Grants but very few grants over £120,000 (or £40,000 per year) are made and most grants are for much less. Consideration will be given to funding support costs incurred as a direct result of running the project. PLEASE NOTE: organisations that already hold a grant from Children in Need can apply for further funding providing the current grant is coming to an end within the next 12 months. Applicants will need to be able to provide convincing evidence of the difference(s) the grant has made to the lives of the disadvantaged children and young people the organisation has worked with. o Organisational overheads or running costs which the organisation would incur whether the project was running or not. o 11.59pm on Wednesday 13 September. Applicants must refer to the A-Z Guidance document before making an application. Application forms are available to complete online at the Children in Need website. The W H Smith Community Grants programme is, however, a grant application scheme rather than a public vote and can be useful for very small grants (often only £100-£250) that can be awarded relatively quickly. Grants of up to £500 are available, although the vast majority of awards are for much less than £500. There is not a requirement for applicants to find match funding. o On supporting education and lifelong learning, helping people of any age to achieve their educational potential. All applications must be for the benefit of a UK community. o Expeditions or overseas travel. o 1 April to 30 September. The application form, which is very straightforward and easy to complete, can be found online at the Trust's website. During 2017 the Postcode Local Trust will fund projects that are of local importance across England, Scotland and Wales that support wildlife areas, sustainability initiatives, local indoor and outdoor spaces and citizenship, such as local volunteering projects. (b) Grants for up to £10,000 for those in Wales. PLEASE NOTE: this is an extremely competitive grant programme with high levels of unsuccessful applicants. Potential applicants are herefore strongly advised to read the programme’s guidance notes before applying. 2. Applicants that are registered with the Charity Commission/OSCR and can provide a charity number can apply for between £500 and £20,000 (or £10,000 in Wales) in funding. o Volunteering initiatives that help local projects, local areas and local people through, for example, uniform youth organisations. o Demonstrate a sustainable impact beyond its original duration. o Focused on improving the environment for the benefit of local communities and encourage conservation action at a local level. o Organisations with tax exempt status but no registered charity number. 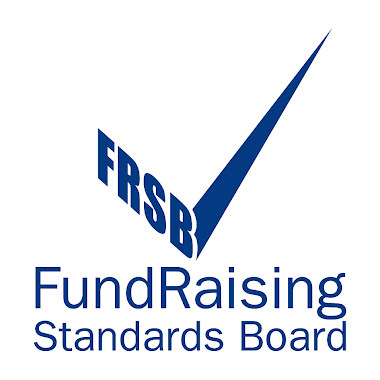 o Organisation with registered Charity number from OSCR or the Charity Commission. The Trust will consider applications from branches of national charities if the branch has its own charity registration number. However, this does not extend to local Wildlife Trusts. All applicants must be able to provide proof they are a constituted organisation and have an organisation bank account. All registered charities, with an income above £25,000, should have a financial reserves strategy in place. There is a long list of items that cannot be applied for. These can be found on page 10 of the Guidance Notes (see link at the foot of the page). There will be two grant rounds in 2017, with a two stage application process. o Round 2 Expressions of interest: Tuesday 1 August 2017 to Friday 18 August 2017. Guidance notes and an online application form can be found on the Trust's website. Thinking of applying for a lottery grant? The Powys Fund currently comprises 4 grant programmes, offering support to individuals and groups based in Powys for the purposes of education and recreation/leisure. The Fund makes contributions to projects of up to 50% of costs and grants of up to £1500 are available for groups and up to £500 for individuals. Details of the programmes that are open for applications are below. Each has its own specific criteria and geographic area of benefit. You DO NOT need to apply for a specific scheme; the grants team will put your application forward to the most relevant fund. This programme has two annual deadlines of 28th February and 31st August. Applications are invited within the six weeks prior to a deadline. This programme is now currently OPEN. The Vegetarian Society is offering funding for local groups and not-for-profit organisations in the UK to hold activities or events in celebration of National Vegetarian Week 2017. For 2017, the Vegetarian Society has introduced large grants of up to £2,000 and four application rounds. Small grants of up to £200 or Larger grants of up to £2,000 are available for events and activities that attract those beginning their vegetarian journey, meat-reducers and the veggie-curious, but are inclusive of the wider vegetarian community. Take place during National Vegetarian Week 2017 (15-21 May) or in the two weeks before. Promote National Vegetarian Week exclusively as the primary purpose of the funded activity. Are exclusively vegetarian or vegan. (Events cannot have non-vegetarian food or drink). Not for profit organisations in the UK (eg community groups, schools, social housing schemes, youth clubs, Cubs, Brownies, Scouts or Guides). Informal groups of friends, parents or students. Vegetarian groups, local network groups and student vegetarian and vegan societies (whether they are formally part of the Vegetarian Society network or not). Large Grants - 22 January and 26 February. Small Grants - 26 February and 30 April. The Burgess Land Trust is running a small grants scheme for the young, disabled and elderly in the areas of Welshpool, Trewern, Guilsfield and Castle Caereinion. Applications must be with the Trust no later than April 3, 2017. To apply for an application form please contact Roy Norris, Burgesses’ Land, C/o Morgan Griffiths LLP, Cross Chambers, High Street, NEWTOWN, SY16 2NY or email roy@fulmar.demon.co.uk, phone 01686 622217. BBC Children in Need is currently accepting applications from charities and not-for-profit organisations in the UK, the Isle of Man and the Channel Islands that support children and young people who are 18 years and younger. Illness, distress, abuse or neglect. Living in poverty or situations of deprivation. Organisations must be working to combat this disadvantage and to make a real difference to children and young people's lives. Projects achieve these differences by either working directly with children or seeking to improve their social and physical environments. Priority will be given to projects where a relatively small amount of money can make a big difference for children and young people. The 2017 deadlines for applications are 1 June, 1 September, and 1 December 2017. The Transform Foundation has launched the 2017 funding round of its Charity Website Grant Programme, which will be providing £18,000 grants to charities to fund the redevelopment of their website. The Transform Foundation is a charity that provides grants and other resources to the charity sector to fund innovative digital projects. The Charity Website Grant Programme forms part of the Foundation’s wider efforts to support the charity sector in effectively making the transition from traditional forms of fundraising and service delivery towards more digitally focused models. The 2017 funding round follows the successful pilot funding round in 2016 which funded the development of websites that have already gone on to raise hundreds of thousands pounds online for the successful applicants. The grant is principally aimed at charities with annual incomes between £500,000 and £30 million, although smaller charities with ambitious plans for digital can also apply. Larger charities will also be considered for specific project or fundraising sites. Any type of non-profit organisation may apply, with successful applicants in the past including causes as diverse as community development, disability, education, theatre, mental health, hospices, national heritage, volunteering, family, children and youth, addiction, homelessness, international aid, and arts. There is a two-stage application process. Stage 1 applications are accepted on an ongoing basis. Grow Wild is awarding £500 to young people aged 12–25 to lead projects that will raise awareness about the importance of UK native wild flowers and plants. Get Creative: We’re looking for talented and imaginative young people aged 12 - 25 to raise awareness about the importance of UK native wild flowers and plants by using visual art, music, poetry, dance, theatre… whatever it is that you’re good at! Transform a Space: We’re looking for project ideas that raise awareness about the importance of native wild flowers and plants and their diverse habitats. Your project can involve more than sowing and growing – as long as it communicates a message about UK native wild flowers and wild spaces in a creative way. Think wild, innovative and eye catching! Deadline for applications: midday Monday 27 February 2017. PAVO TRUSTEE NETWORK - JOIN TODAY! Are you a trustee? Do you sit on a committee? Governance is an issue that affects any group, no matter what size it is. PAVO along with the Charity Commission is wholly committed to championing good governance in the sector, and trustees play an enormous part in enabling this to happen. 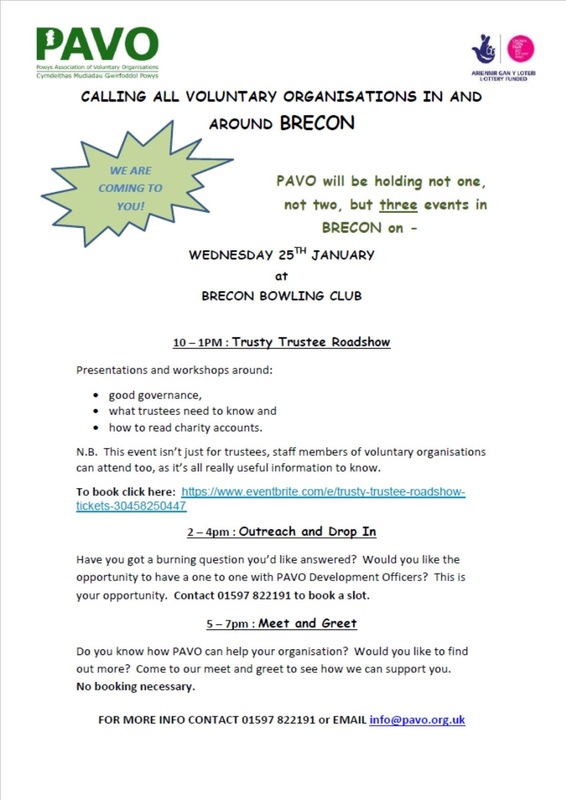 The PAVO Trustee Network has been set up in order to provide mutual learning and support to trustees of voluntary or community organisations operating within Powys (including charity trustees, management committee members and not-for-profit company directors). The virtual network will ensure that members are kept up to date electronically with news, information, and developments in the field of governance and trusteeship. provide a forum for determining the training and development needs of trustees. allow trustees the opportunity to be consulted and feedback on strategic policy developments. We want as many trustees as possible to sign up to become a member of the network, so don’t delay, join today! Through its Open Fund for Organisations, the PRS for Music Foundation offers grants to promoters, large performance groups, talent development organisations, venues and curators that promote and encourage new music in the UK. The PRS for Music Foundation, an independent charitable organisation, is the UK's largest independent funder purely for new music of any genre. The Foundation works to stimulate and support the creation and performance of new music across the UK. To support the creation and performance of outstanding new music in any genre. To develop artists to their full potential. Grants of up to £10,000 are available for projects that involve the creation, performance and promotion of new music, and enable songwriters, composers, artists, bands and performers of all backgrounds to develop creatively and professionally. The Foundation prefers to make contributions to projects rather than fully funding them. Projects involving the creation, performance or promotion of new music by living, UK-based music creators (eg a commission, residency, education project or tour). Programmes that strongly feature or are based around new music (eg promoting a series of live events featuring outstanding new music, the new music component of a festival programme, artist/composer/talent development programme or multiple commissions). Equipment/rehearsal space hire if it is an essential part of the project. Promotional activity/PR costs relating directly to the group’s development as a music creator/the project. Website creation (only if crucial to the promotion of the project). Music videos when part of wider project activity. Contingency (up to 10% of the total project budget). Concerts, record launches, gigs, tours, installations, festivals and promoters which feature a significant programme of new UK music. Administration costs relating to the project can be funded to a maximum of 10% of total budget. A maximum of £5,000 can be used towards recording costs. There is a two-stage application process. The 2017 deadlines for stage one applications are 6 February 2017, 8 May 2017 and 2 October 2017. Further information is available from the PRS for Music Foundation website. Tech vs Abuse is a new £300,000 fund launched by Comic Relief and funded by the Tampon Tax. The Fund is for technological innovation and creative digital solutions, to improve the safety of women and girls affected by domestic violence. Grants of between £20,000 and £50,000 are available over a period of one year from August 2017 to August 2018. It is anticipated that up to seven grants will be awarded. Grant awards will include additional support from social-tech development experts, which will include a start-up workshop over two days at the commencement of the grant, connections to tech experts, on-going mentoring and two peer learning days in November 2017 and April 2018. Comic Relief will also be holding three advice days (13, 14 and 15 February) so that groups may discuss their application. Potential applicants can book either a 30-minute phone call or online discussion by clicking on the Doodle poll HERE.. Grants can be used for digital solutions at any stage of development, from conceptual stage to those with existing solutions. 5. Realising it is abuse - Use the creative opportunities of the web to raise awareness of what an abusive relationship looks like, provoking women and girls experiencing abuse to recognise this and get support. Projects without a digital partner in place at the point of applying will also be considered. The funding will support new technology development as well as low-technology solutions and any training and resource publications required to meet these design challenges. Comic Relief is particularly supportive of innovative approaches ensuring these solutions have high immediate impact or a lasting legacy beyond the life of the funding. There is also interest in solutions with the potential to scale up, whether this is gained through buy-in across domestic abuse support agencies, by open sourcing the solution or ensuring shared learning and the possibility of replication. o Organisations which adopt a partisan political stance or activities which are party political. Not-for-profit organisations or partnerships based and working in the UK can apply as long as they have a governing document. There is no restriction on the annual income of the organisation or partnership applying for a grant. Applicants that currently have another grant with Comic Relief or have received an award previously may also apply to the Fund. The deadline for applications is 12 noon on Monday 13 March 2017. Full details, along with the online application form, can be found on the Comic Relief website. This training aims to ensure that organisations who receive EU funding comply with the law, good practice and the obligations of their funding agreements. Knowing who your stakeholders are is a vital element of public engagement at all levels. It is the starting point for any engagement activity and invaluable in the on going process. A stakeholder analysis tool with particular reference to citizen and community engagement will be shared and there will be the opportunity to begin your own stakeholder map or to refresh an existing one. This course aims to equip you with a useful tool to help your engagement activities become more focused and effective. These sessions are free to third sector organisations currently delivering, or with an interest in delivering, a European funded project or contract. These sessions will be delivered in English. The Rural Community Development Fund (RCDF) offers grants which are primarily aimed at LEADER Local Action Groups and other community-based organisations. The Marina Kleinwort Charitable Trust offers grants to support arts organisations active in the UK. Grant awards tend to be for between £1,000 and £5,000. Match funding is not an essential requirement. Funding is likely to be extremely competitive. During the year ending 6 July 2015 the Trust made just 12 awards to arts organisations totalling £36,000. o Wilton’s Music Hall Trust (£2,000). Funding is not available for individuals or to applicants that are unconnected to the arts. Applications may be submitted at any time but must be made in writing and should include a copy of the applicant’s most recent report and financial statements. Only successful applicants are notified of the Trust’s decision. PLEASE NOTE: the Trust does not maintain a website. Further information is, however, available on the Charity Commission website. Barchester Healthcare Foundation Continues its 2016 Priority in 2017. Barchester Healthcare Foundation is accepting applications from small community groups and small local groups helping adults aged over 18 with mental and physical disabilities, and older people aged over 65. Barchester’s Charitable Foundation is a registered charity based in London. It was created by Barchester Healthcare in 2000 to give something back to communities where the Barchester care homes operate. The Foundation's priority is continued from 2016: connecting or re-connecting people with others in their local community. Applications that combat loneliness and enable people to be active and engaged will receive the highest priority throughout the year. Grants of between £100 and £5,000 are available to groups in England, Scotland and Wales. Applications can be submitted online at any time. The Wolfson Foundation and the Theatre’s Trust are working together to provide funding for projects that deliver urgent building repairs, and which can demonstrate that without such repairs the viability of a theatre and its future as a place presenting live theatre work to audiences is at risk. Grants of up to £15,000 are available. There is no match funding requirement. o Operate theatres that are statutory listed or which are otherwise of architectural significance. o Projects which are in receipt of other funding from either the Theatre's Trust or the Wolfson Foundation. The grants panel meets twice a year to discuss applications. An application form and further terms and conditions are available to download on the Theatre's Trust website. PLEASE NOTE: potential applicants are advised to contact the Theatre's Trust to discuss their project before submitting an application. The Margaret Dobson Trust aims to make grants to UK charitable organisations that provide services for young adults with learning difficulties and other special needs after they reach normal school leaving age, so that they can learn skills to help them live more independent lives. Registered charities, charitable incorporated organisations (CIO’s) and Community Interest Companies (CIC's) are eligible to apply for a grant of up to £5,000. In exceptional circumstances the Trust will consider awarding a higher amount. Although match funding is not an essential requirement, the Trust welcomes any attempts made to source funding from elsewhere as its annual grant allocation has averaged just£30,000 over the last five years. PLEASE NOTE: to be eligible for funding organisations must have an annual turnover of less than £1 million. Grants will not be made to organisations which have received funding in the previous year - except where a specific project has been awarded funding over a period of more than one year. o Applications from smaller organisations which are demonstrating an entrepreneurial approach to a locally identified issue. o Running costs where it can be shown that the charity may close if not supported at this time. o Information on how the impact of the project will be evaluated. o There will be a demand for the service to be provided. o Organisations that are overtly religious. The next application deadline is Friday 31 March 2017. Applications will be considered at the Trust's annual meeting in June. o A Business Plan (if the organisation is new). All applications should be sent to the Trust’s Secretary at the address provided below. For further information, visit the Trust’s website. The performance piece ‘in the absence of silence’ that is at the heart of the project with survivors of domestic abuse being undertaken at The Welfare in Ystradgynlais is visiting the Theatre on the evening of Friday 10th February. 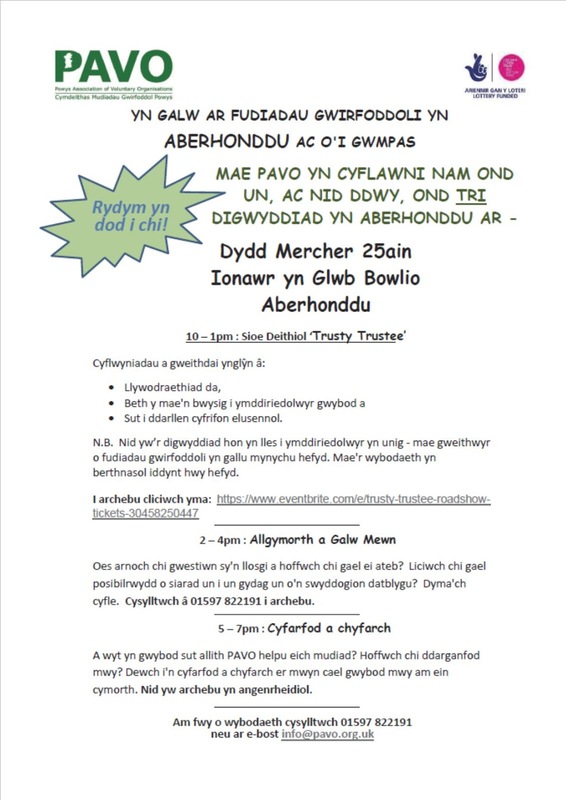 This piece of drama was created by survivors of domestic abuse in South Gwynedd and developed with De Gwynedd Domestic Abuse Service. We are also very fortunate to be working with world renowned Theatre Company, Chickenshed, which means this is also a very high quality piece of theatre. The piece works as a drama in its own right, but also serves as a training opportunity for anyone wanting to find out more about domestic abuse. The performance will be followed by a Question and Answer session with the theatre company and people involved in domestic abuse services. This is a practical session. To get the most out of the workshop, participants will need to bring a laptop or tablet. You must book a place in advance. Please state which day you would like to attend. There is a maximum of twelve people for each session so a first come first serve basis will apply. ● £200 of match funding (ring-fenced for every group that signs up) as an extra incentive to fundraise online! BRECON - WE ARE COMING TO YOU! The Joseph Rowntree Charitable Trust is inviting applications from charitable organisations carrying out work at a national level. The Joseph Rowntree Charitable Trust is interested in funding work that focuses on removing problems through radical solutions, and not simply about making problems easier to live with. Generally, the Trust funds work that is about addressing the root causes of problems rather than delivering services or alleviating immediate needs and recognises that change can take many years to achieve. As a result, the Trust is willing to take the long view and to take risks. The use of 'soft', rather than 'hard' power as a first line of response to conflict within society and around the world. The de-legitimisation of violence as a tool for responding to conflict, securing interests or projecting power. A culture of human rights and non-violent problem-solving, promoted at all levels of society. Power and Accountability - to support people to create a world in which power is more equally shared, and in which powerful institutions are responsive and accountable to wider society and aligned with the long-term public interest. Rights and Justice - to promote racial justice and equality of opportunity as a basis for a harmonious multi-racial, multi-ethnic society in the UK. Sustainable Future - to develop and promote sustainable, low-carbon alternatives to the current consumerist and growth-based paradigm. Northern Ireland - to fund work which will contribute as a strategic level to the ongoing transformation of the Northern Ireland conflict. Cross cutting proposals which directly relate to more than one priority are also accepted; however, this must be clearly demonstrated in the application proposal. Organisations should be undertaking work at a national level. This means work that seeks to make positive change across the UK as a whole, or across one or more of its member countries - England, Scotland, Wales or Northern Ireland. The deadlines for applications for Northern Ireland, Sustainable Future and Cross Cutting applications are 27 March 2017 and 21 August 2017 (12 noon). The deadlines for Peace & Security, Power & Accountability and Rights & Justice applications are 10 April 2017 and 4 September 2017 (12 noon).